Our instruments are designed to enhance the high efficacy of our trichological products. They are used at our Cesare Ragazzi Laboratories Centers and are part of our Standard Work Protocol. Vapoozono: CRLAB Steamer machine that releases ozone in the vapor. The warm vapor emitted from the steamer is useful to open pores freeing the scalp from toxins while allowing the penetration of the products. The ozone released acts as an antibacterial agent for the scalp. Tricopress: This CRLAB machine produces a targeted mechanical massage to the scalp. It enhances skin elasticity, stimulates microcirculation and helps spread the CRLAB trichology products on the scalp. Tricopulse: CRLAB’s Low Level Light Therapy (LLLT). This practical helmet has 252 diodes and is used to prevent hair loss, reduce dandruff, itchiness and bacteria load of the scalp. Compared to other professional lasers in the market place, CRLAB’s LLLT device is affordable and mobile. TRICOGLAM PROFESSIONAL: LED technology to increase blood flow and microcirculation. 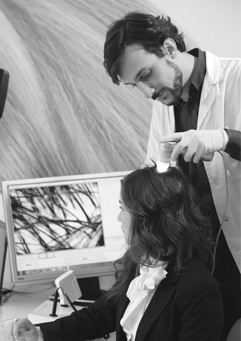 The treatment enhances the processes for restoring normal physiological functions of the skin and hair bulb, with consequent results on the whole hair. The shaft becomes stronger, the diameter wider and the density increases. This device is able to treat the main anomalies of the scalp (itching, redness, dandruff, seborrhoea) and prevent hair loss using 320 total DIODES between lasers and LEDs. Energy light: penetrates bacterial barriers and destroys their DNA. Treatment indicated for problems of itching and redness of the scalp, dandruff, seborrhea or dermatitis. LED technology strengthens the hair follicle: prevents further fall and stimulates hair regrowth. The increase of ATP (adenosine triphosphate) is stimulated, which allows the bulb to increase its cellular activity: the hair is stronger and more robust. Treatment indicated for thin and brittle hair. The metabolism of the hair bulb is stimulated, increasing the microcirculation of the scalp. Treatment indicated in case of problems of thinning and androgenetic alopecia.